In my class, the goal of homework and assessments is to let the students show their stuff. I am often amazed at how a student who is terrible at reading comprehension quizzes is able to clearly articulate the theme of a book when allowed to display his or her knowledge in a variety of ways. 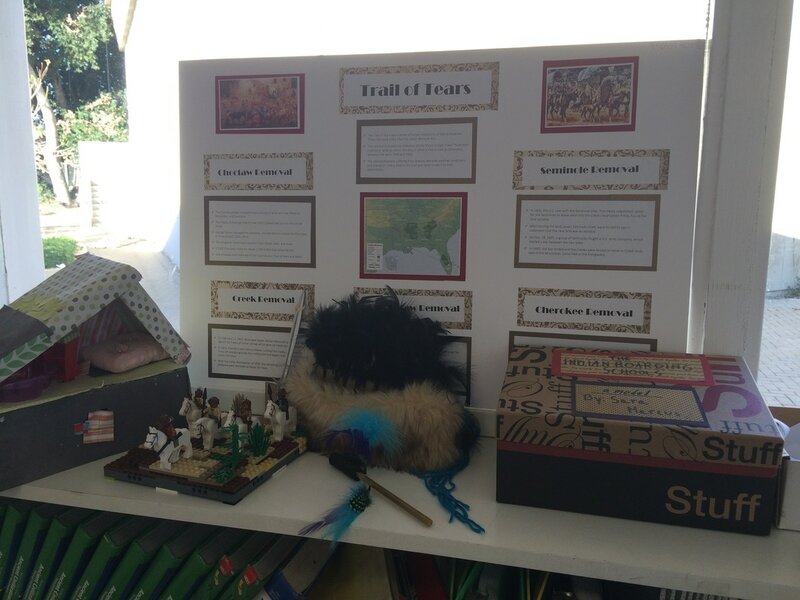 Click here to view a student presentation on Manifest Destiny. Click here to view a presentation on Digital Citizenship. LEFT: 8th grade student working with two Kindergarten students. The project was to work with the K students to create their own book. The objective of the unit was learning collaboration skills with groups from different backgrounds and teaching the Kindergarten students the concept of how a story is laid out (i.e. characters, plot, setting, etc.) Click here to view the text of the collaboration story written by the 8th grader and Kindergarten student in the picture on the left. Left: Student works on an interactive timeline about the Civil War. This was a final assessment for the Civil War Unit. 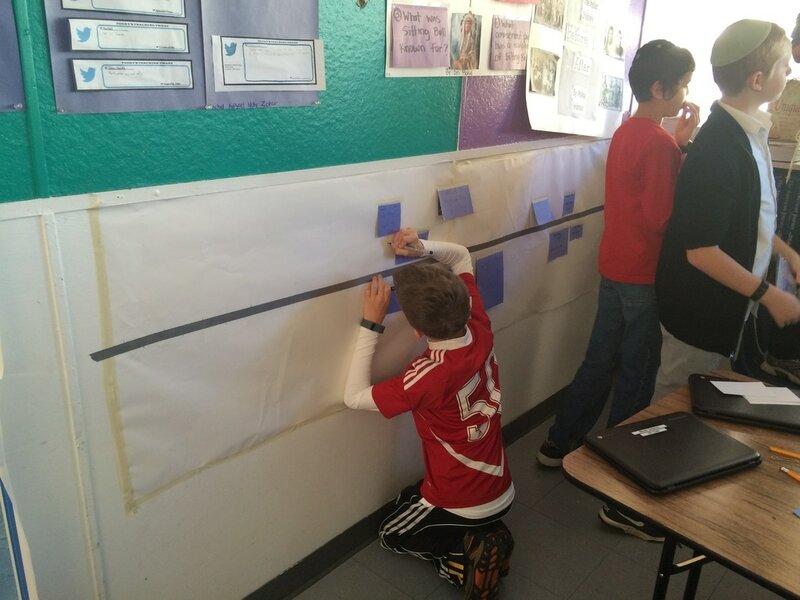 He asked if he could create his timeline in the classroom and I gave him the back wall to do it. On each blue flap was a question or a date. Underneath it were the details. 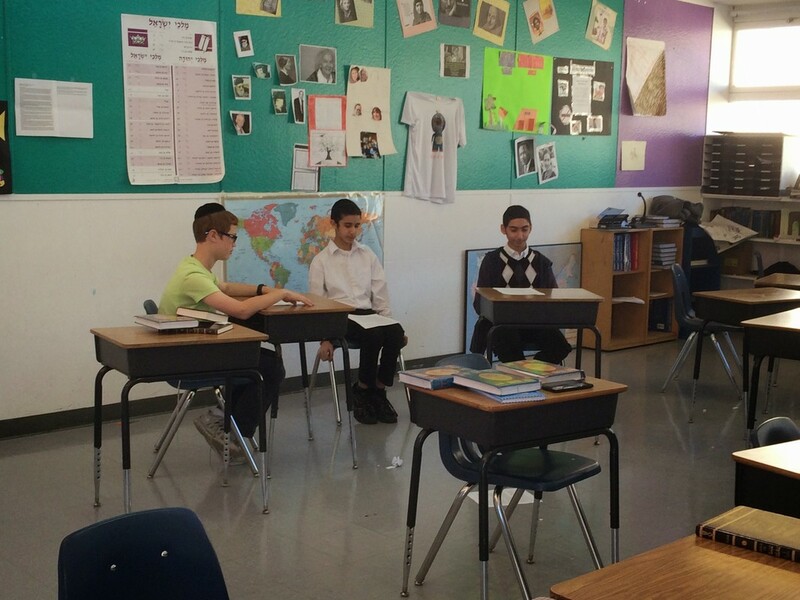 Left: Students practice for an interview skit based on the lives of Frederick Douglass and Abraham Lincoln and their roles in African American History. Students had to create the script and execute the interview in front of their class. 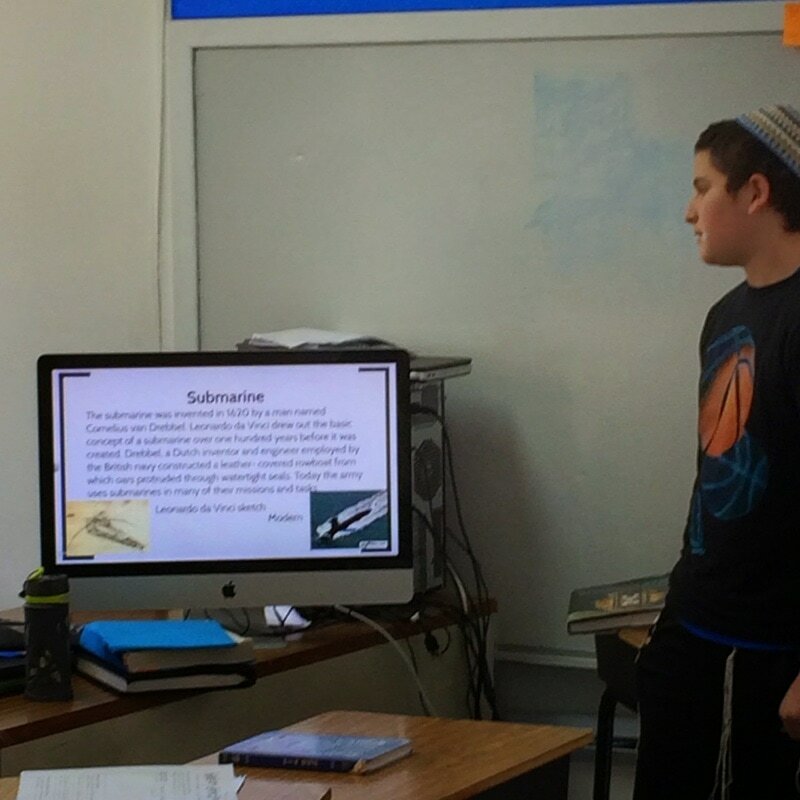 Student presents a prezi on Renaissance inventors. Some students are not artistic or creative and find it easier to display their knowledge in a paper or presentation. Always create room in assessments for these kinds of assessments. Student displays a replica of Queen Elizabeth's Crown and a shoe box diorama of her palace. Around the crown and in the windows of the palace were details of the Queen's life. She had asked me if should could do something besides take a test or write a paper at the end of our Renaissance unit. She came up with this project herself. Student displays Leonardo da Vinci's great inventions from his notebooks. The student built these himself. He gave a very detailed lecture on the inventions and whether historians believe da Vinci actually built them. This was another student who asked if he could do something besides a paper or prezi on da Vinci's inventions.